On Sunday May 24th, 2015, a two thousand years old ritual will take place inside one of the most famous monuments in Rome, the Pantheon, also known as Church of Santa Maria dei Martiri. On the occasion of Pentecoste, indeed, hundreds of red rose petals will be poured inside the Church through the huge hole located at the center of its dome. 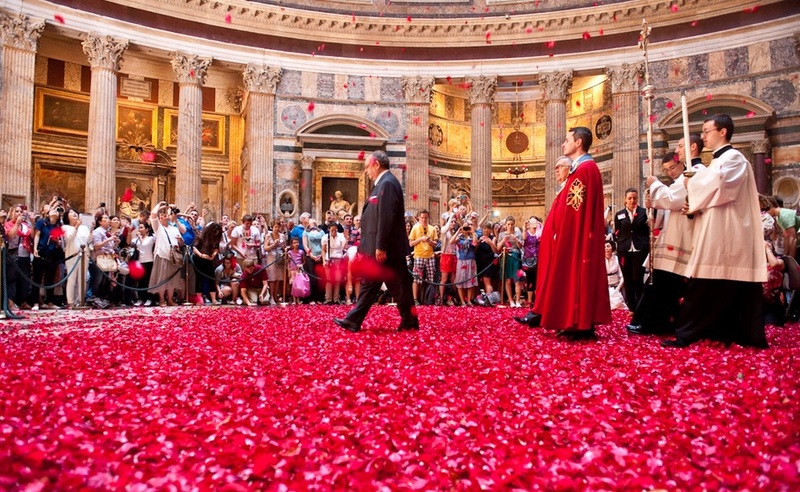 The Pentecoste feast celebrates the descend of the Holy Spirit on earth following Jesus Christ’s sacrifice, whose blood is actually represented by the red roses petals themselves. This rite occurs once year from the time of the earliest Christian communities, when the former pagan temple dedicated to all the gods (which is the original meaning of the word “pantheon”) was converted into the present Church. The red rose petals celebrations will be part of the mass starting at 10:30 am. You can easily go to the Pantheon by bus from Termini station: ask our staff at Hostel Des Artistes for more info!